Caroline Aitken talks us through a list of jobs to help keep us busy on the short winter days to come. Winter is upon us and here on my smallholding in Dartmoor we’re enjoying the fruits of our labour while preparing for the growing season ahead. The outdoor working day is shorter now the nights are drawing in, but there’s still plenty To Do. In the annual veg garden we’re cleared the harvested beds which will need to be mulched with compost. 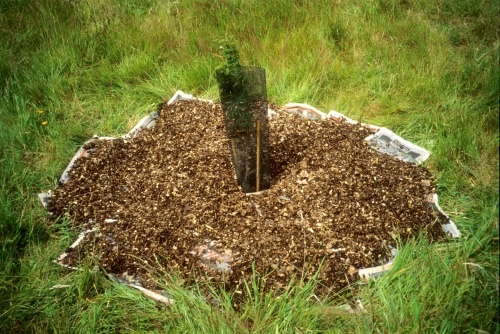 If you are on an exposed site you could cover the compost with another layer of mulch such as straw or bracken to protect the soil while the beds are out of use, but if you have a major slug problem like we do you may choose not to, as these kinds of mulches can harbour hibernating slugs and protect them from freezing weather. An organic spot mulch made with newspaper and woodchip. As we’re about to use all of our compost on the beds we started making a new heap a few weeks ago. Compost is made in layers of greens (soft, green sappy materials high in nitrogen) and browns (dry, fibrous materials high in carbon but non-woody) at a ratio of about 2:1 in volume. Layers are built up over time as materials become available and the compost should be ready to use next winter. If you have at least a cubic meter of fresh materials all at once you could try making hot compost. Because of the volume the heap gets nice and hot as the microbes get to work. This speeds up the process and can make compost in just 2 months, although it would take longer in cold weather. Once the heap has heated up and is beginning to cool down again you should turn it to get the uncomposted materials on the outer edges in to the middle. Turning not only mixes in the materials to get even composting, but also aerates the heap to get those microbes activated again. Many weed seeds will be killed in the process so you can be less choosy about what you throw in, and some pathogens will be killed too, although I wouldn’t recommend including materials known to be diseased. 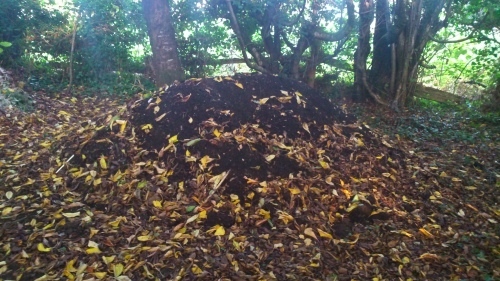 Fully matured compost, with a light cover of leaves. Perennial crops will also benefit from being mulched with compost, and our WWOOFers have been putting a good layer of our neighbour’s well rotted horse manure around the fruit trees. Young trees under about 4 years of age will benefit from being mulched with either a woven plastic or an organic spot mulch to reduce competition from grass. Herbaceous perennials will be dying back now so you can chop and drop the brown foliage to create mulch which will protect the roots from heavy frost, especially if the plant is a bit tender. In our garden we have lots of ferns, bracken and Crocosmia (Montbretia) all of which produce lots of fibrous leafy material which is ideal for mulching as it forms a good mat on top of the soil. We have around 30 fruit trees so pruning is a big job which we try to start as soon as possible to make sure we get it done before the spring. Having has such a mild autumn there are still a lot of leaves and fruit on the trees so we’ll need to wait for those to fall before we begin pruning. Cool dry days are best, not too cold and not too windy. I find pruning is a real pleasure when I get into the zone, and once I’ve got my eye and my hand in the work gets quicker and easier, so I try to give myself a few hours at a time to get in to it. Blackcurrants can be pruned from autumn onwards, so we’ll be removing the black, three year old wood to soil level to build up a good crown of shoots. We grew our blackcurrants from cuttings three years ago and we had our first good crop this summer. Other currants should be pruned after about mid February, just taking out dead and crossing wood and reducing the length of leading branches by up to two thirds. Prunings are generally too woody for composting unless shredded, but they make a wonderful crackly bonfire. 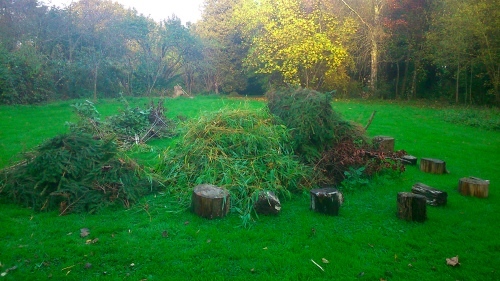 These piles have built up over the past few weeks, so we’ll check for hedgehogs and other hibernating animals before adding them to the bonfire. Our piles of prunings and brash, waiting for November 5th, the English Halloween. We have plenty of other jobs on the list such as tree planting, netting the winter brassicas, making leaf-mould and keeping the wood store well stocked. Trees should be planted before February, and need a day when the ground is not too wet or frozen solid, and wood needs to be bought in from the woods to dry out in the woodstore before we can use it in the woodburners. This will keep us busy outside while the light holds out, but on the long winter evenings we’ll have plenty of time to plan the year ahead. Now is the time to order seeds before they get out of stock. We will be planning our annual veg on rotation and the guilds or groups of plants we be growing in polycultures. There is great joy in plotting next year’s bounty while we enjoy this year’s and applying what we’ve learned from the mistakes, successes and failures. In October I thought I could draw breath and put my feet up for a moment I remember that I need to sow broad beans by the end of November to get an early crop in the spring, and there are overwintering crops like spring and summer cabbages and cauliflowers to plant out too. 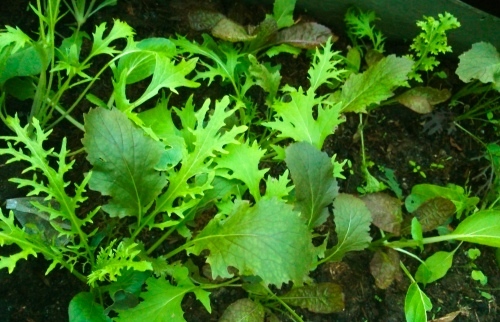 The greenhouse is already full of delicious winter salads like pak choi, red mustard, mibuna and mizuna. Pak Choi, mizuna and giant red mustard. It’ll be February before we know it and the snow drops will be showing us that there is still life out there! Then it will be March and there will be loads of seeds to be sown and the garden will be in full flow again. Looking at the list it’s clear that we can enjoy the long nights by the fireside, but we can never rest on our laurels!